I finally got to do some patchwork sewing on Friday night and some late today. 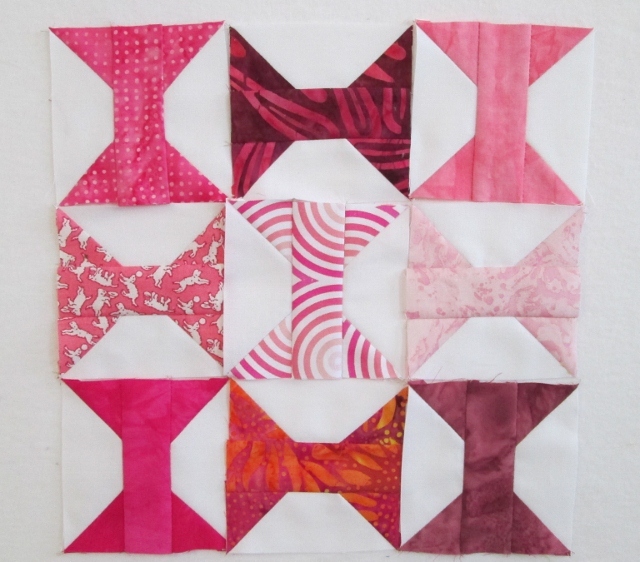 So I got started on my Pink scraps. 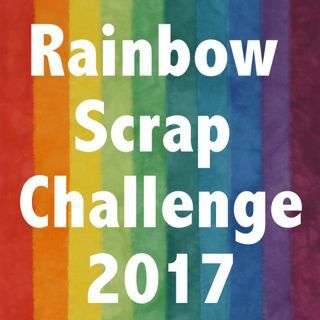 I am planning to do the Rainbow Scrap Challenge 2013. I did great at keeping up last year. Please check it out and join me on using up the little bits of fabric. I came across a row by row this fall and kept it in mind. It was week #2 over at Bee in My Bonnet that I found the butterflies. I love adding in White as my background and keeping the body of the butterflies in black. I really love Row 4 Apples and cores. I will have to find some way to use the apples. I got 20 done. I thought I would start with the butterflies because they use large pieces of fabric. The Butterflies measure 4 1/2" unfinished. I have also done 9 spools. I started this midway thought last year. They are a leaders and enders challenge from Bonnie Hunter. 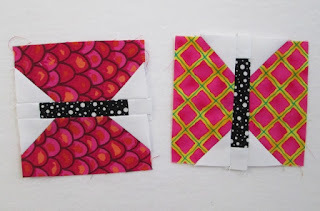 I have added today's post to Soscrappy Linky Party. I really like those butterflies, may have to try a few of those. So cute. Thanks for the links...a new blog to read! Super cute butterflies. The apples look really fun too. What a great variety of scraps you came up with. Oh, your butterflies are soooo cute. I'll be making some of these! 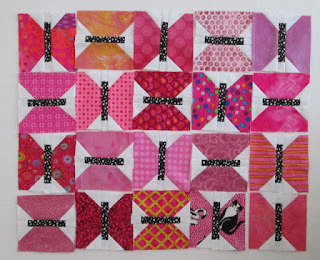 I'm just pinned a spools quilt last night! Your butterflies and your spools are fabulous. You're really making progress. Love the butterfly blocks! Great idea to use white for both blocks; I may need to order a large amount of white yardage. What is your favorite white fabric? The Flutterby's look great! I am thinking of spools as well. Just haven't started them yet. Beautiful butterfly blocks! I made the apples from that quilt along but that is as far as I got. Love the butterfly's! A bunch of red and green apples would make a wonderful quilt.